Guts and Glory Tennis continually playtests and evaluates strings with the goal of identifying the best performing strings for our customers. Modern technology has allowed the production of poly-based strings to take quantum leaps forward in terms of overall performance. Guts and Glory Tennis has been on the cutting edge of these advancements and has consistently been the first to offer the top performing strings to our customers. The WeissCANNON series of co-polys clearly ranks at the very top of these strings and we are pleased to introduce them to the USA. Silverstring sits squarely at the pinnacle of poly-based performance strings. This string smartly combines smooth overall playability along with power, control, comfort and solid tension maintenance. Many users claim the Silverstring is among the very best overall poly-based strings on the market today. This high performance string is available at a reasonable cost and clearly outperforms higher priced competitors. Construction: Monofil CoPolymer. The absolute highest grade molecular chain of polymers is used in the manufacturing of the Silverstring. These high grade polymers are mixed with powerful chemicals and trace elements of Fluorcarbon Elastomers. Advantage: The Silverstring is fresh and unique; clearly designed to be a higher-level and better performing version of the world's most popular poly-based offerings. If you are seeking superior overall performance in a poly-based, this string is solid in virtually all areas. A string with no real weaknesses. Works great as a full string job and plays well in a hybrid. Why we carry this string: Given the fact that we believe it is one of the best overall co-polys current available, it would not make sense for us to not make this terrific product available to our customers. We carry this string for our customers who demand the very best in performance from their poly-based strings. Silverstring is the flagship of the WeissCANNON line. It is one of the most technogically advanced and complex poly-based strings currently in production. Players will immediately appreciate how the technology translates into superior on-court performance. While this string plays a bit firmer than some of the other WeissCANNON products, it is still quite comfortable. Players using the Silverstring will realize controllable power, excellent spin potential and long lasting performance. CONSTRUCTION: Monofil CoPolymer. The absolute highest grade molecular chain of polymers is used in the manufacturing of the Silverstring. These high grade polymers are mixed with powerful chemicals and trace elements of Fluorcarbon Elastomers. ISO 9001 = Certified Quality Standard for absolute reliability and consistency in the manufacturing of this product. ADVANTAGE: Users of this string will appreciate the premium overall play. An abundance of controllable power, with excellent comfort and tension maintenance. COMMENTS: Silverstring is chocked full of premium high tech materials and has been developed by a company who was intimately involved and familiar with Luxilon products. The Silverstring offers a refreshing and unique level of playability; clearly designed to be a higher-level and better performing version of the world's most popular poly-based offerings. The popular early generation poly-based strings and many of their clones tend to play much harsher and are not able to match this product in terms of tension maintenance and overall performance. Many will want to compare this string to the Luxilon ALU. The likely conclusion is that the Silverstring does offer some similarities, but provides greater comfort and holds the high level of performance significantly longer. (See tension section below) The Silverstring stands out with a feel that is unique among poly-based offerings. Silverstring users often describe it as smooth and plush amidst a flurry of superlatives. TENSION: Using an ERT 700 we have taken the following tension measurements using the Silverstring 1.20mm in a Prince Original Graphite OS racquet. This data reflects measurements using a racquet that also has experienced several hours of court time throughout the measurement period. Why not conduct a personal playtest today? We have tried to make it easy by allowing you to place a set or more in your shopping cart directly from the left column of this page. 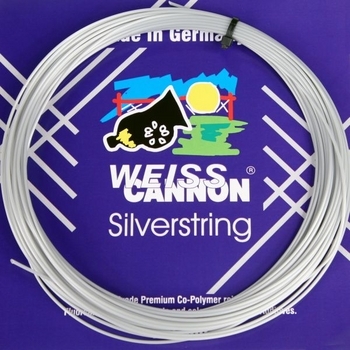 Please follow the WeissCANNON Silverstring 660' Reel link if you prefer to save money by ordering in larger amounts. What else can I say? The Silverstring is pure bliss on my Head Youtek IG Prestige MP. Excellent pocketing with combination of power and comfort.